Have you finally accepted a breakup and passed through all of the stages of grieving yet you still cannot seem to get this person out of your mind? You may still be in love with him, or harboring anger towards him which is related closely to still loving him. If you have ever had one of those nasty breakup situations, you may be able to relate. You feel like someone has dumped toxicity onto you and you just can’t rid of it. Negative energy can make you feel sick, ruined, and spiritually depressed. If your ex love was a sociopath personality they may have put you through an idealize, devalue, then discard cycle that can make you feel like you’ve gone from the top of the world to the bottom of it. This is what your ex wants, is to ruin you. If you are resigned to being over it and still can’t get him out of your mind here are a few tricks to mentally cleanse yourself. First try Wiccan smudging. 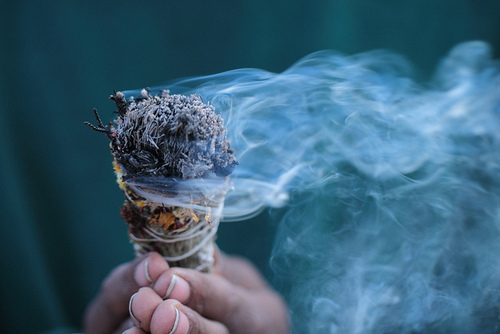 Utilized in cultures across the world, smudging involves using a sweet smelling plant or incense to fill up a space with a good scent and ergo a palpable good energy. The smoke from a smudge stick is meant to be used in a spiritual ceremony that scrubs away all of the bad thoughts and obsessive thoughts about this person. Try a fragrance such as sage, cedar, sweet grass, or an essential oil candle. You can purchase various smudge sticks from a Wiccan supply store or buy the materials online to make your own. Let the smoke move all around you and fill up your mentally free of him area in your home. Wash away all of the negative energy. Watch the smoke and visualize your good intentions to move on without this person tied to your heart and soul. Let his aura no longer be with you and clear thoughts of him from your mind, your heart, and your home. As the smoke fills the surroundings your energy should be lifted back to where it needs to be. Another way to get rid of a negative energy, person or even negative thoughts within yourself is to use a mental exercise to symbolically snap him away. The idea is to snap or flick your bad energy away. Visualize the emotional gunk flying off of you and leaving you clean and cleansed of the negative person and allow thoughts of him to leave. You can clap your hands, snap, or revamp your environment completely so as to clear his negative energy right out of your mental train of thought. Remember that you must protect yourself from allowing bad energy to get into your mind and take root. It’s mind over matter. Lastly, if you want to get rid of a negative energy and forget completely about this person then try to visualize a pure white light pouring over you and washing the bad vibe of this person away from you. Sunlight and a beautiful day is wonderful for this. Even taking a walk in the sun can let you feel the warmth of nature. Remember if you are dwelling on a negative person and feeling down on yourself that getting outdoors into the bright sunlight can really help. As the warmth of the sun pours over you it will wash away any bad vibes. Let the sun deliver healing, joy, and inner peace back into your mental head space. Always remember that you never know what the future will bring. Love yourself and be good to yourself always. Take care of yourself. You have so much potential so it is time to forget about him for good and move on with your wonderful life!